Do you have news, reviews or comments for 'Pet Sematary'? The movie wants you to know this isn't your daddy's version of 'Pet Sematary.' But did it accomplish its goal? Review: The new adaptation of Stephen King's classic Pet Sematary spirals down into silliness more often than darkness. Pet Sematary made the strange move to reveal its big twist in the trailer, but it doesn't make sense in the movie and ruins it. Two major new releases made their debuts on the UK box office this weekend as Shazam! from the Warner Bros. DC Universe stable did good business and horror film Pet Sematary did OK! Making its debut at the top of the Uk box office Shazam! makes a good £4 million debut, lower than other super hero movies but for a little known character not bad. In comparison it is lower than recent origin films Wonder Woman , Aquaman and Captain Marvel but about the same as Marvels Ant-Man who was similarly fairly unknown. Dumbo falls into second place on its second weekend of release with the Tim Burton movie taking £3.5 million over the weekend pushing its total UK gross to £12 million. A new adaptation of Stephen Kings horror novel enters the box office at number 3 this week with £1.5 million, perhaps a little lower than expected considering the hype. The original adaptation took half a million pound on its debut in 1989 which adjusted for inflation is about £1.5 million, the same, that film went on to make £1 million (£3 million adjusted) so expect similar from this version. The Brie Larson and Samuel L. Jackson starring movie takes £1.2 million on its 5th weekend of release pushing its total UK gross to £34.6 million. With a high turnaround on the charts at the moment the films is not only the highest grossing movie on the UK top 15 but also the longest running film on the charts at 5 weeks. One for the kids at number 5 this week as Peppa Pig returns to the box office for the first time since 2017 where it takes just under a million pound on its debut. Warner Bros. delve into their DC Universe characters with a less known character that was the original Captain Marvel, and its childlike humour pleases audiences and takes it to the top on its debut weekend. Making its debut at the top of the US box office with a debut weekend gross of $53.4 million is this origins film from the DC Universe, but not part of Warner Bros. official series of films. Audience and critics both seem to like the film, similar to how Deadpool took the super hero genre in a different direction, which should put the film on path to a decent final return. The adaptation from Stephen Kings novel enters the US box office at number 2 this week with $25 million, half that of Shazam! Although getting good word of mouth the film is not getting the same kind of buzz of the authors previous adaptation, It, from 2017. Falling from the top to number 3 on its second week of release the Tim Burton directed movie takes $18 million this weekend pushing its total US gross to $76.2 million. Jordan Peele's much praised horror film is starting to fall fast down the box office, it takes $13.8 million on its 3rd weekend of release for a $152 million total. Finally in the top 5 is Marvels official version of the Captain Marvel character, 5 weeks in its takes $12.6 million which pushes its total gross to an incredible $374.1 million, Shazam! will not reach that during its box office run. Spending a 7th week on the US box office this week is the dragon based animation, the longerst run of the week, the films has now taken $156.6 million. The new films from the DC Universe tops the global box office this week with ease as Shazam! knocks Dumbo off the top spot, Pet Sematary and P Storm also enter in the top 5. Entering the global box office at the top on its debut weekend is the original Captain Marvel who is now known as Shazam! and makes its debut with $155.5 million from 80 countries, the highest on the chart this week. With the Marvel version of Captain America also making its debut just recently its interesting to see this DC, almost forgotten character who was a Captain before Carol Danvers still manages a decent debut. Tim Burton's live action version of Disney's much loved animation falls to number 2 this week with $57.8 million from 56 countries. This puts the films total global gross at $213 million after 2 weeks of release. Stephen Kings famous novel gets a second films version and makes its debut at number 3 this week with $42.3 million from 47 countries. The film has had a lot of hype but average reviews so we could see this sink quite quick and not repeat the success of It from a couple of years back. Making its way into the top 5 after a few weeks of release this Chinese film is released in just 5 countries but manages to gross $27.5 million. Rounding out the top 5 this week is the Marvel version of the Captain Marvel story which takes $26.7 million on its 6th week of release. This push the film past another milestone as its now past the billion dollar mark with a global gross of $1.04 billion. 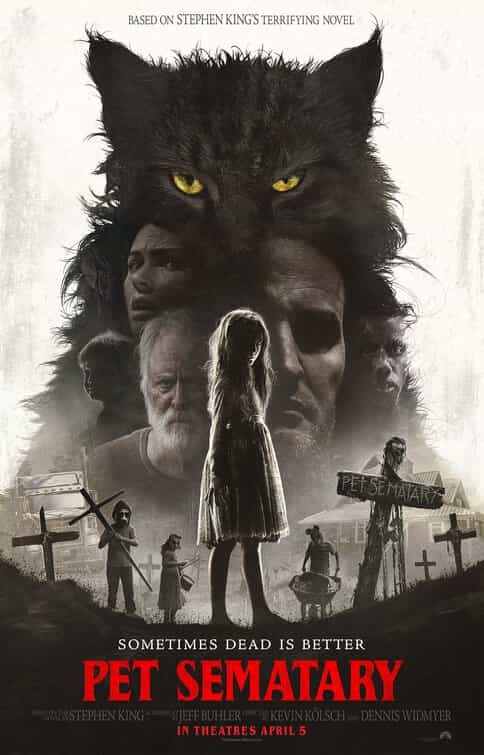 A new adaptation of Stephen Kings Pet Sematary hit cinemas on 5th April 2019 starring Jason Clarke and John Lithgow. Looking a little more creepy than the 1989 adaptation this version also looks to be more faithful to the original text. The BBFC has given the film a 15 certificate in the UK for strong bloody violence, gore, threat and the official run time is 101 minutes (1hour 41 minutes). Despite there having been an adaption of Stephen Kings Pet Sematary you cant keep a good book down her this year we get a new version. Directed by Kevin Kolsch and Dennis Widmyer this new version looks to be a edge of your seat adaption. Released on 5th April 2019 you can check out the new trailer below. Pet Sematary is number 7 on the UK box office this week.